A few days ago I started an off-season series related to MLS fans in Columbus who are dealing with the very distressing news that their ownership has threatened to move the team to Austin, Texas if they don't get a new stadium in downtown Columbus. That day we heard from an Army veteran and life-long Columbus resident named Alex talking about his memories of the team stretching back to his childhood. Today we're going to hear from Jon, a gentleman I met during the 2017 season at the Broken Cauldron before an Orlando Pride game. He was here in town to see some of his favorite USWNT players, and he told me he would be back the next week to watch the Crew take on our MLS side. That was in August, months before we heard anything about the Crew's ownership threatening to move. It was actually in exchanging messages with Jon after that news broke that the idea for this series was hatched. Today I'll bring you his story. Jon Robinson is 25 years old. He's been following the Crew since 2013 and has been hooked on them ever since. Besides his love for the Crew, Jon has a passion for aviation and he's currently studying Air Transportation at The Ohio State University. As with all of these columns in the series, I urge readers to post links to them everywhere you see the #SaveTheCrew hashtag to help get out the word about these passionate fans and raise awareness that the MLS is starting to go in the direction of other major sports leagues in the country--they are threatening to move teams to pressure cities into caving to the demands of billionaire owners and millionaire players. As fans, we have to stand up against this nonsense and make them remember that no sports leagues would exist without generations of fans who bought season tickets and cared enough to attend the games to grow the leagues in the first place. 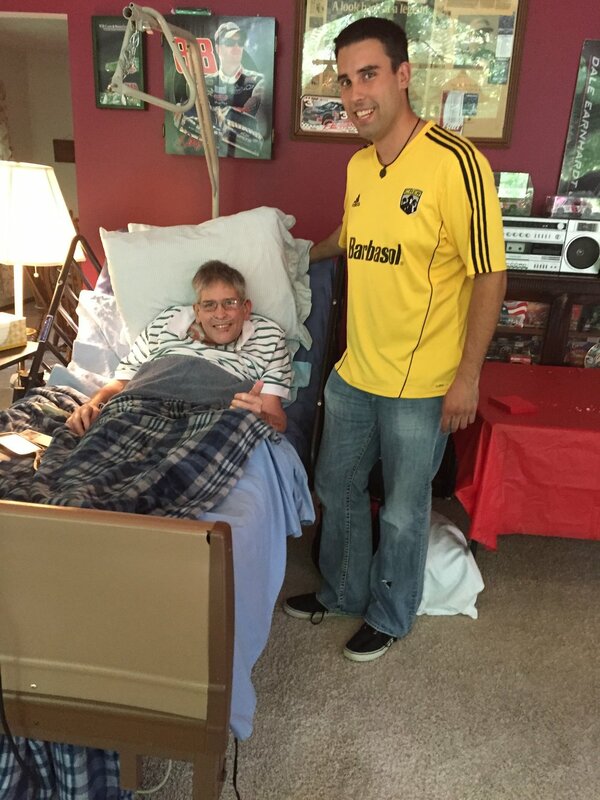 Lion's Teeth Blog (LTB): What is your best gameday memory as a Columbus Crew fan? Jon Robinson (JR): There are two that stand out. The first one would have to be on November 8th, 2015. The Crew were in the playoffs and were facing Montreal Impact on the second leg of the Eastern Conference Semifinals after suffering a 1-2 loss in the first leg. I wanted to go to the game but the cost of tickets was too much for me at the time, so I planned to watch the game with a few friends at their house. It turned out that my mother got my sister, Emily, and I tickets to the game. We showed up to the stadium and discovered our seats were center field, three rows from the grass! The seats were amazing and former Crew player, Kei Kamara, scored one of the most beautiful headers I’ve ever seen just four minutes into the game. Emily and I were both standing and screaming that our star, Kamara, had done it yet again! The crowd was pumped early and the Crew was determined to win that night. We ended up winning the game 3-1 and advancing all the way to the MLS finals. The second great memory was taking my 8-year-old cousin, Jack, to his first match--which happened to be against Orlando! Though the game ended in a tie, the kid had a blast! He was waving my city of Columbus flag every time I turned around, and he was yelling the Columbus and Higuain chants as loud as he could! He talked about that match for weeks and became one of my regular match partners in crime! LTB: What is your favorite part of attending matches at Mapfre Stadium? JR: MAPFRE Stadium has become my second home. When I met Ken at the Broken Cauldron before the Orlando Pride game, I told him that this was a very different pregame experience, drinking at the local bars/pubs, than what I would do at home before the Crew games. MAPFRE is located at the state fairground, maybe five miles north of downtown Columbus. When you get to MAPFRE, you see a giant parking lot full of cars and everyone is grilling out, drinking their beers, and playing every tailgate game you can think of. This season I wanted to take it to a new level, so I purchased a three-foot wide camping grill to host my own tailgates. When I first bought it, the idea was to cook food and have some beers. This became a place where my regular group would get together not only discuss the game and eat but talk about life and all the things that were going on in everyone’s life. Along with my purchase of the grill, I also ordered a 15-foot portable flagpole to hoist up the Crew and an NWLS Chicago Red Stars or Washington Spirit flag under it! We have the look of our own little supporter group and I am very proud of it! LTB: Describe the game, the player, or the experience that made you fall in love with the Columbus Crew and really identify it as your team. JR: Watching Ethan Finlay in 2014 and 2015 really made me fall in love with the game. Not only is he pure talent on the pitch, but away from the game, he was one of the players that was always willing to go out of his way to talk to the fans and help the community. LTB: Away from the pitch and the stadium, what is the importance of the Columbus Crew to your city? JR: I think our players make a major impact in the city of Columbus. Our homegrown player and captain, Wil Trapp, volunteers at Columbus City Schools to help kids with their homework. Another thing that the Crew does that I think is wonderful for the community is the Give Forward Foundation that the Crew has set up. Brad Stuver, our back up keeper, and his wife, are almost always doing something with the Give Forward program to help better our beautiful city. Another example that really means a lot to me is our back up forward, Adam Jahn, decided that he was going to raise money for the Pelotonia Bike race on his own time. The race is a giant cancer fundraiser in the state of Ohio and all the funds go to The Ohio State University Hospital and the James Research Center. LTB: Describe the pain you would feel if the Columbus Crew were to leave the city. JR: For me, this team is my rock. In February 2015, my father, Dean, was diagnosed with spinal cancer and unfortunately lost his life to it in July 2015. I was put through a lot of stress dealing with him being in the hospital for most of the time. The Columbus Crew was my escape from all that stress and heartache. I would put on the crest every weekend and just enjoy the game and not have to worry about anything. After my father died it got even harder, but the team was always there for me to escape to. If the Columbus Crew does mover to Texas I’ll be heartbroken. Not only is it my rock, there’s a good chance it’s a lot of other fans' rock too! LTB: What's a unique aspect of Columbus Crew matches that you would miss if the team were to leave the city? JR: One thing I would miss is the energy from the Nordecke, our supporter section. They bring the energy every game they go to. This energy isn’t just at home games but travels with them to away games, too. I had the opportunity to go to the US Open Cup match vs Cincinnati--also known as the “Hell is Real Derby”! A friend who watched the game on TV told me that you could hear our Crew supporters over the Cinci fans. LTB: Are you a member of a recognized Columbus Crew supporter's group? JR: Unfortunately no, but I do plan on being a part of GCGBAG (Greater Columbus Golden Boys and Girls) next season, and many seasons after! LTB: Do you have season tickets for the Columbus Crew? JR: I had my season tickets for three years now. LTB: Anything else you want to say about your love for the team? During the 2017 season, I met a tourist from the Columbus, Ohio area at the Broken Cauldron before an Orlando Pride game. We struck up a friendship and talked about the rivalry that Orlando City and the Columbus Crew developed during the 2015 season when we seemed to play them about seventeen times. When the news broke that the Columbus Crew ownership is considering moving the team to Austin, Texas if they can't get a new stadium, I heard from my new friend again. I asked if he and his friends could share what it would mean to them if the team left Columbus. Today, I want to bring you the first post in a series I'm calling #SaveTheCrew Stories. We know what the talking heads are saying. We know what the pundits are saying. We know what the MLS league office is saying. But as a fan blog, I wanted to let other fans tell the story of how they feel. Today's story comes from an Army veteran and a lifelong Columbus resident named Alex Voisard. I started by asking Alex to tell me a little bit about himself, his love of his local MLS side, and what the Crew leaving Columbus would mean to him. Alex started by telling me he's 28 and has been playing soccer since the age of four or five. He played through grade school and in high school he played for St. Charles Prep High, where he was a classmate with Chicago Fire goalkeeper Matt Lampson (class of 2007). Alex has followed the Crew since the MLS started, and watched them play at the Ohio State University soccer complex before the MLS stadium was built. And in February 2001 he was at the game in Columbus when the USMNT defeated Mexico 2-0 in what was then just known as Crew Stadium. That stadium went on to be known as "The Fortress" for the USMNT, and Alex attended every match of his club and the USMNT that he was able to make. But there was a time after high school when his schedule was set for him by a very influential Uncle Sam. Alex enlisted in the US Army and served four years, both at Fort Campbell and deployed to Afghanistan. While deployed he managed to find a weekly pick-up game at the FOB with players from around the globe. Most of the other players were from Africa and the Middle East, Alex recalled. He told me it was always a very special treat when he managed to catch some live Columbus Crew games at one or two in the morning local time. Even halfway around the world, Alex kept up with his beloved hometown team and stayed active in the game he enjoys so much. Watching the Crew at the FOB while deployed in Afghanistan. You can take the soldier away from home, but you can't take home away from the soldier. Then I asked Alex to give me and my readers a few of his favorite memories related to being a fan of the Crew. Lion's Teeth Blog: What is your favorite matchday memory at a Columbus Crew game? Alex Voisard: I had just returned from deployment a few weeks before we started our run for the cup in 2015. I got to come home for the weekend and watch the Crew play Drogba and the Montreal Impact at Mapfre Stadium in the two game semi-final. That game they selected me for the hometown hero, where they have a service member stand on the field in recognition of service, which I loved. I then ran upstairs, changed, and supported my team to victory. 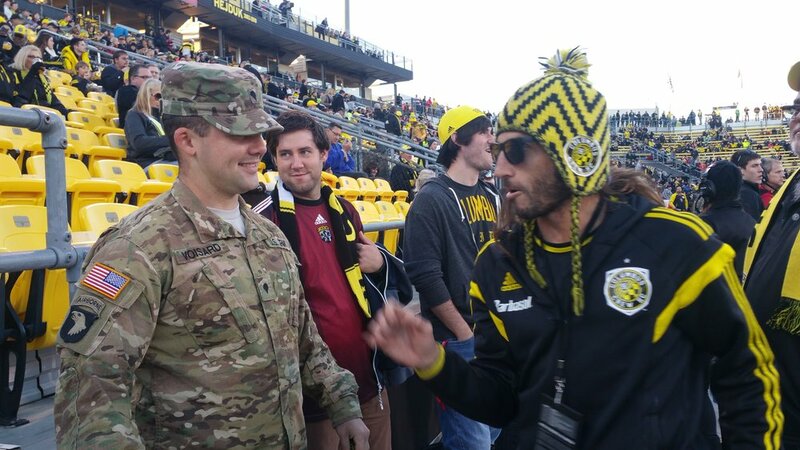 Alex before the match with Crew legend Frankie Hejduk. What makes the day memorable for me was the recognition, seeing the team live for the first time in a few years, and also going to use the restroom TWICE and the team scoring BOTH TIMES while I was in the restroom! I missed two of the three goals on my first live match back! But I was excited and just glad that we had won and could see our team off to the next round. Not only did everyone around me show support to me for my service, but they joked with me about going back to the bathroom to extend our lead! I loved every minute of it--from the pre-match tailgate to going home with a smile on my face. AV: It would have to be the tailgating that has developed here over time. I was talking with a few friends about how that seems to be an Ohio thing due to other teams not tailgating or having the ability to tailgate. [Editor's note--Orlando City fans have been creative in 2017 with finding lots where they can tailgate, but it's just not the same as gameday at the old Citrus Bowl where every lot around the stadium was one huge tailgate party.] My buddy Jon has been to LA and Orlando, and I have been to Chicago for MLS matches. There doesn’t seem to be a lot of tailgating anywhere else like we do it here in Columbus. We went down to Cincy for the "Hell Is Real" Derby for the first time ever in Crew vs Cincy history, and were unable to tailgate. We could have tailgated in the parking garage, but it's not the same. I enjoy talking to and having drinks with fans around us in the tailgate lots. The supporter groups get together and tailgate, and I have drinks with them--we have a great time even before the game starts. I don’t think we would like to have it any other way. LTB: What is the importance of the Columbus Crew to the city, away from the pitch and the matches? AV: In a word--amazing. I see on social media all the time how the Crew players give back to the community by building turf soccer fields and surrounding them with tall fences to keep the ball in like indoor pitches. At that same location, they built some playground equipment and things for the park. But that’s not the best part. I am studying Portuguese at OSU as a second language to just learn the language. On a whim, I contacted the Crew front office and asked if Artur, our new Brazilian player, could come and speak to our class. I figured the worst they could say was no. They came through and we orchestrated a meeting with Artur to speak Portuguese to our students at the Ohio Union on campus. I am so glad that I did ask, and I got the right people in touch with each other to make that wonderful opportunity happen. During my time at Ohio State, I plan on trying to make this a yearly or every semester thing with anyone on the team that speaks the language. It made the community come together with the team and also welcomed Artur, a non-English speaking player, to help him feel more welcome to join our club. Now Artur comes to campus every from time to time to hang out. I saw him on a walk from one class to another and a few other friends have seen him on other occasions walking around on campus. I’ve never heard of anything like it from other clubs. Matt Lampson [who previously played with Columbus from 2012 - 2015] does his Cancer Society appearances, which I love and follow. Does anyone else do this? LTB: Can you describe the pain you would feel if the owner moved the Columbus Crew away from the city? AV: The pain I would feel for the club leaving would be all around: mental, physical and emotional. It would hurt in every aspect due to the history I have with soccer and the Crew. I attended my first Columbus Crew match when I was seven! I’ve never followed another team or sport as much as I have the Crew. If they left, I would still watch and follow soccer in Europe and the MLS, but it would never be the same again due to not having MY team in MY city playing--having someone to be proud of and say, "That’s our team out there," winning or losing. I love Ohio State football and I don’t care for hockey. But if the Crew left, the Blue Jackets and Ohio State Buckeyes would be all that we have here--but it wouldn't be the sport I love with every fiber of my body. LTB: Was there a player or moment that made you really embrace the team or made a special impact on you? AV: Brian McBride. He showed me what it was to be committed to soccer. Growing up and watching him, he gave his all every game and played to the best of his ability, win or lose. I grew up wanting to play to the best of my ability and to give it my all for my grade school team and my high school team. What really showed me all of this is the fact that he has had more surgeries on his head than I and my entire family have had all together. He went in for every ball and really showed dedication to winning and playing well even after breaking his face from another player's elbow or head. He even took a bicycle kick boot to the face, but he wanted to continue playing through the pain of broken bones and swollen eyes. I haven’t looked at the information in a long time but he has multiple plates and screws throughout his head and face. He was the player that I wanted to be someday. A striker or forward that scored and give my all every game no matter the score and to the best of my ability. He was a player that everyone could get behind and root for. That’s when I knew it was our team. Our Columbus team. LTB: Are you a member of a recognized Supporter's group and/or do you have season tickets? AV: I am a member of the Hudson Street Hooligans. I love the group and have gotten along with everyone in the group since I joined. I clicked with Donny, the starter of the group, the first time I met him. It has been great ever since. I first got season tickets as soon as I could buy them, which was the year I got out of the service. I got out in March of 2016, and I bought my season tickets in February of 2016 so that I could watch every home game from now until I pass. I have had them now for two years and have just renewed my tickets for next year. I never want to miss a match! Even though I'm now engaged and I've got things to do I have only missed a couple of matches in two years. I went to a wedding this year where I missed the Atlanta game, which we lost. But it’s OK now because we just won the knockout round against them! I want to see every match and cheer my team on to victory. I kind of get it from my mom’s friend who hasn’t missed a home Ohio State Football game in over 20 years. I consider that dedication and love for the team and sport, and I want to follow in her footsteps. Her own sons even know to not schedule anything on those days. She has warned them she would even miss their weddings if they scheduled them on game days! LTB: What's a unique aspect of Columbus Crew games that you would miss if the team left the city? AV: I would miss the atmosphere and love for the sport and the team. We may not be Camp Nou, but the fans that are there are soccer and Crew die-hards that love the team and this sport just as much as I do. We may not fill the stands and the soccer community may be small here, but we cheer and love our team just as much as any other fans in the league, if not more. I would dearly miss the fans around me cheering every bit as hard as I do; I'd miss the stadium erupting in cheers when a goal is scored; I'd miss the high fives from strangers and friends; I'd miss everything about the match. I hope to pass memorabilia to my sons or daughters when I have them, and to my grandchildren, and I hope to continue to grow the sport of soccer within my family when I have one. I already have my fiancé hooked. I also want to have season tickets forever and then add to my tickets by taking my future family all the way to grandchildren and great-grandchildren if I end up with that opportunity when I am older. I want to share a passion of mine with my kids and hope they choose to play soccer growing up. But I won't be able to do that if the team leaves. I’ve been told that in European soccer stadiums and some NFL stadiums like Lambeau Field in Green Bay, the seats have to be passed down from family members or friends. I hope that soccer in the U.S. aspires to grow that much and be that dedicated in the future. At that point it’s not just about money--it's about loyalty, passion, love for the home team--and most importantly, it's about family. As Orlando City fans we know a bit about what it feels to lose something: we've lost our founding head coach, seen our club's President step away from operations and move off to begin a new venture, and we've seen some beloved original players leave the roster for other teams or to start new chapters of their lives. But we haven't had anyone threaten to take our club away. Personally, I can't imagine how I would feel--so I'm both humbled and very grateful that some fans have chosen to share their story with my little blog and let me and my readers know what their club means to them. If you want to do something to help #SaveTheCrew, then feel free to post links to this story everywhere you see people using that hashtag. Maybe if enough people post enough fan stories, the folks in the MLS office will realize what a bunch of nonsense it would be to move one of the founding franchises of MLS out of the city that has embraced the team as their own for over 20 seasons. The MLS season is in a short break for the Gold Cup, so it seems an apt time to look back at the first 20 matches of 2017 and assess how the club is doing compared to the same point in the 2015 and 2016 seasons. There is no doubt that when the season started, the first two months gave Orlando City fans the hope that this might be the year that the club put everything together for a magical season and could make a deep playoff run. But the multi-match weeks in May and June did leave many fans scratching their heads and wondering what the balance of the year will bring. My crystal ball is no more accurate than any other pundits, but I have run some numbers, collected some facts, and made some observations and have some opinions about how the team will fare the rest of the year. Others will doubtless have different opinions--some more rosy and some more dire than mine. And I encourage and welcome any discussion. But after the last few days of teasing the mid-season recap, I present it all here for your review and assessment. Above the Line. So far this season, Orlando City has spent every week in playoff contention. This is a big improvement over the first two seasons, and the early season string of wins buyoed by many matches at Orlando City Stadium helped Orlando City to get off to a strong start. New Contributors. Another factor for Orlando City is that Jason Kreis brought in several defensive players that helped to secure wins early when the team seemed to struggle to score goals. With new players like Jonathan Spector and Will Johnson in the lineup, fans have felt confident the team could hold a 1 - 0 lead for the first time in the MLS history of the club. Anemic Offense. However, the offensive output has been lacking. Through 20 MLS matches in 2017, Orlando City has only scored 22 goals, compared to 32 goals scored over 20 matches in 2016 and 26 goals scored over 20 matches in 2015. Improved Defense? Even with the new defensive players, the 2017 campaign has not seen the best defense of the Orlando City MLS era. In 2017 the team has conceded 29 goals, compared to only 26 goals conceded in 2015. But the performance is much better than the 35 goals conceded in 2016 through 20 matches. Depth is an Issue. And the depth of the team is definitely in question. As long as the team was playing one match per week in March and April, they looked very strong, winning 6 of their first 7 matches and shooting to the top of the Table. However, when the MLS scheduling gods saddled Orlando City with 3 matches per week for most of May and June, the team really struggled. Since the beginning of May they have only won 2 of 13 matches, balanced against 6 losses and 5 draws over that period. Key Player Waived. One more troubling issue for Orlando City fans is that the team could not come to terms with Matias Perez-Garcia and has released the player. MPG was one of the most consistently hard-working players on the pitch for Orlando City, and consistently drew free kicks for the team by putting himself in position to take hard fouls from opposing players. The loss of MPG makes an already thin starting line a little thinner unless there is an opportunity to bring someone else onto the club that can assume his salary and role and perform as well or better. Silver Lining. There is a bright side. Even with all the struggles, the good thing for Orlando City fans is that the team is still above the red line in 5th position for the playoffs. This puts them higher than they have been at this point in either of the previous two season. If my calculations are correct, the team was in 8th place and out of the playoffs after 20 matches in 2016, and they were in 6th position and dropping out of the playoffs at this time in the 2015 campaign. The team is also scoring points better than any previous MLS version of the team. In 2015 the team were only managing 1.35 PPM after 20 matches, and in 2016 they were managing only 1.15 PPM after 20 matches. Depth makes a huge difference in the MLS season. Between the heat and the travel required to play across North America, the addition of midweek matches in the middle of the season means that for a team to win consistently, they need at least 15 - 18 players that can be part of a consistent Starting XI. Teams at the top of the table like Chicago and Toronto are able to drop players in and out of the starting lineup with little change in the results. They are still able to score well and defend well when their usual starters have to have some rest. But Orlando City is not there yet. When we have to rest our usual starters due to midweek matches or little niggling injuries, we do not seem to be able to match the same success. Early on the team managed to win when Kaka was nursing a hamstring injury suffered after 10 minutes of the opening match of the season, but in hindsight that appears to be more an aberration than a pattern, especially when the multi-match weeks began in May. Orlando City suffers from a rash of players that are "one trick ponies." We need to draft, mold in our academy, or trade for more players that have a bigger range of skill sets. Cyle Larin is a devastating scorer if you put the ball on his feet, his chest, or his head in the 6-yard box. But outside of that he largely appears to be a lost puppy wondering what to do. He is an inconsistent defender and he has trouble finding teammates with passes or even dribbling the ball to help create his own opportunities. Carlos Rivas is a great dribbler and a very sharp passer, but he is extremely inconsistent when it comes to his finishing touch. He is still far more likely to get under the ball and shoot yards above the goal into the stands than he is to be on target when he shoots. And Kaka is really starting to show the miles on his legs. He is still capable of dazzling opponents and fans a few times per match as he dances on the ball or fakes out a defender, but Marta shows far more consistent wow-factor moves on the pitch than Kaka does these days, and she is equally able to create her own shots or find opportunities for teammates, whereas Kaka seems to have lost a step from 2015. I still think this team will make the playoffs, but I don't think they will be in the top half of the playoff contenders. I think 4th - 6th is where we will see the team land after the regular season ends. And that assessment is contingent on no unexpected trades, injuries, or disciplinary issues that drastically impact the lineup over the remaining 14 matches of the season. I think the team needs to get better talent. We may not need to trade away any stars or fan favorites from the team, but in terms of role players, we need some more depth and we need players who have a broader skill set. As I said it feels like we have too many "one trick ponies" on the team, and we need to have more players who can create chances, distribute the ball, finish chances, defend opponents, and pass to teammates at a high level of skill. Until we do, I don't see us moving much past simply reaching the playoffs. What are your thoughts on the season so far? Do you think Orlando City is in good shape at this point, or do you worry about what will happen in the balance of the season? Do you think it was a mistake to part company with MPG, or do you believe that the club has an opportunity to sign a player who can help to fill in some of the missing gaps and push the team back toward the top of the playoff bracket before the end of the season? Let me know in the comments below! "I'm disgusted with his antics," an angry Luis Enrique said late Friday, discussing the four-match suspension for his superstar player, Lionel Messi. "This is the last straw--he's out!" Then the Barcelona FC manager announced that the club had agreed to a rights swap with MLS side Orlando City SC, effective immediately. The swap would see the Argentine superstar go to Orlando for up-and-coming striker Cyle Larin. According to rumors, each player will assume the other's contract, salary, endorsements, and kit number. MLS Commissioner Don Garber was found at his favorite deli with a late night coffee-and-donut snack. When asked about the trade, Garber said, "Well, you know--it's just one of those things that happens in football. It's pretty rare for a mega-star to be swapped for a potential mega-star, but I think there's usually about one day every year that you can expect to hear news like that, right around the start of April when the European clubs are getting desperate for the final push to the end of their season." Orlando City majority owner Flavio Augusto da Silva was seen at a private party toasting everyone and laughing uncontrollably, clearly giddy at the news. Officials at FIFA and La Liga could not be reached for comment on this story. Yesterday the kickoff week festivities began in earnest with the annual Purple Pride 5k and the Open House for the new stadium. The 5k was a sellout and the Open House was very well attended. I met up with some friends shortly after 9 am and we spent the next couple of hours touring around the stadium on the western side. The two ends and the eastern side of the stadium were not open for touring because an army of construction workers are still putting the finishing touches on the facility. With only a few days left until the Kids vs. Pros event on Thursday night, there is not much time to finish whatever final touches the stadium needs to be ready for live matches. One of the most interesting parts of the open house was seeing the locker room and getting to make the walk through the tunnel from the locker room out to the pitch. I captured most of this walk on video toward the end of my visit to the Open House yesterday. I said that almost everyone would be coming home to the new stadium when play opens next week. One notable exception will be Brek Shea. The club announced yesterday that they had traded Shea to the Vancouver Whitecaps for striker Giles Barnes. Barnes has scored 33 goals and has 15 assists in five MLS seasons. By contrast Shea has 22 goals and 20 assists in his seven MLS seasons (a time which was disrupted while he was playing in England). I have mixed feelings about the trade. I've always enjoyed watching Shea play; however, it's always felt like he has been somewhat undisciplined and has never lived up to his potential while he's been with Orlando City. It could be that a change of scenery to Vancouver could help him thrive, and for the sake of his chances to get back to the USMNT and contribute as he has done in the past, I hope that the trade works well for him. At the same time, my main concern as a fan is seeing Orlando City win more matches, earn more points, and make the playoffs, so I think Barnes gives us a better chance to do that. Did you attend the Open House yesterday? What was your favorite part about visiting the new stadium? And what do you think of the club trading away Brek Shea? Let me know in the comments below! There have been many roster changes since the 2016 season ended across all the teams in the Orlando City family. There have been some surprising departures and some exciting new signings for all three teams. This weekend we will look at some of the departures and new faces we will see on the pitch in 2017. Defenders: Kyle McFadden, Craig Nitti, and Antonio Matarazzo. Midfielders: Alejandro Garcia, Johnny Mendoza, Marius Obekop, and Andrew Ribeiro. Forwards: William Eyang and Keegan Smith. The drastic amount of turnover is a bit surprising given that OCB was the only team within the club to reach the playoffs within its league. More recently, the club announced a number of new player signings. Scott Thomsen - Defender Thomsen signed with OCB after scoring one goal and one assist in nine appearances with the Richmond Kickers in 2016, his first professional season. Prior to his turning pro, Thomsen played four years at the University of Virginia, with whom he won an NCAA Championship in 2014. Fernando Timbo - Defender Fernando Timbo was signed by OCB from the Ottawa Fury of the NASL. The 26 year-old Timbo has been a professional player for a decade, initially turning pro with his hometown club of Curitiba FC in Brazil, and later playing several seasons with the Austin Aztex before moving on to Ottawa. Zach Carroll - Carroll, another defender, comes to OCB after appearing in 28 matches with the New York Red Bulls II in his rookie season, after a collegiate career at both the University of Virginia and at Michigan State University. Paul Clowes - Midfielder Paul Clowes signed with OCB after a college career at Clemson University and spending most of the 2016 season with the Charlotte Independence. Clowes is originally from England, and he has previously played with the U-23 team for Orlando City Academy. His honors in college include being named Midfielder of the Year for the ACC Conference. Austin Martz - Martz is a Midfielder who was signed by OCB from the Wilmington Hammerheads, where he appeared in 26 matches, scoring four goals and registering two assists in 2016. He has been a pro for two years. Prior to playing in Wilmington, he played in the Maltese Premier League for Pembroke Atheltica FC, and played his college soccer at Georgetown. Jordan Schweitzer - Midfielder Jordan Schweitzer was signed from Seattle Sounders FC 2, where he played his rookie season as a pro in 2016, appearing in 22 matches and scoring four goals. He played his college soccer at the University of Denver, and was named to the All-Summit League First Team three times. Ben Polk - Forward Ben Polk was signed by OCB from the Portland Timbers 2, whose senior team selected him 20th overall in the 2016 MLS Super Draft. Prior to turning pro, Polk may be the most widely traveled of the new faces on the club. He was born in Arizona, raised in the UK, and played for three different colleges in New York before turning pro. In his senior season in 2015 with the Syracuse Orange, Polk scored twelve goals and contributed five assists. Joe Gallardo - Joe made the short walk from the Academy training pitch to the OCB practice pitch, being signed earlier this week from the youth ranks. Gallardo scored three goals in seven appearances in 2016 with the U-17/18 team, helping Orlando City's Pro Academy side reach the top ranking in the nation. Gallardo has played internationally with Mexican academy team Monterey. He has also been in the Youth National Team for the United States, appearing on the U-15, U-17, and U-19 sides. The Pride have also had a number of changes, some of them influenced by changes outside the NWSL. The biggest names impacted are Josee Belanger and Kaylyn Kyle, who were both left off the Subsidized list by the Canadian Soccer Federation for 2017. Due to the way league rules work, Belanger and Kyle were able to play for the Pride as Subsidized players and did not count against the team's roster in the same way as they otherwise would. Without those subsidies, they would count as International players due to their Canadian citizenship, and their full salaries would count against the club's NWSL salary cap. Since the Pride have already filled their allotted five International spots, they could not retain the rights to these players. The oddball and screwy rules about the way roster spots count or don't count against a team when considering things like subsidized status, homegrown status, and generation Adidas are one of the things I think FIFA should streamline worldwide. If a player is on your club they should be counted on your club and that should be that and who gives a rat's hind quarters about all the other phony-baloney nonsense. But I guess that's what keeps all the otherwise irrelevant lawyers employed. OK... enough of me on my soapbox. Let's take a look at some of the new faces that will be gracing the pitch for the Orlando Pride in 2017. Ali Krieger - Krieger is a defender with the USWNT and has played the last four years with the Washington Spirit. Krieger brings a strong defensive presence to the club, which is an area where the Pride struggled for consistency in 2016 due to all the international callups. On the plus side, her experience with the USWNT will be valuable for the younger members of the team, but the downside is that when there are callups there is yet another member of the team who may have to miss some actions. Camila - Brazilian Camila Martins Pereira joins the Orlando Pride after a year away from NWSL play. In 2015 she played with the Houston Dash, and she spent 2016 with Brazilian side Tiradentes. She is listed as a defender, but has the experience and mobility to also play at wing, giving her some versatility to be able to slot in where she is best needed in a lineup or during the flow of play. Danica Evans - Evans is a forward that was drafted from the University of Colorado in the 2017 NWSL Draft. Evans brings a collegiate resume of 28 goals and 19 assists to help spark the offense of the Pride. With Alex Morgan set to miss the first few months of the season playing in the French league, it will be helpful for the Pride to have more strikers on the pitch early in the season. If nothing else, more scoring threats will create greater opportunities for proven scorers from 2016 like Jasmyne Spencer and Kristen Edmonds. Nickolette Driesse - Driesse is another draft pick for the Pride, a midfielder who played in college at both Florida State and Penn State, and she has the distinction of having won national titles with both universities. She accumulated 20 assists and six goals in her collegiate career, and the Pride coaching staff identified her passing game as a key asset they hope can translate to the NWSL. Creating opportunities for more scoring will be important to helping the Pride improve upon their 2016 record. Rachel Hill - Rachel Hill was acquired from the Portland Thorns, who selected her from UConn in the 2017 NWSL Draft. Hill was a forward at UConn, where she scored 61 goals and had 18 assists in four years. She was also a two-time finalist for the MAC Herman Trophy. Hill represents another scoring threat for the Pride in the 2017 season. While adding more players with USWNT experience, I am glad to see more young players on the roster who can fill in if those players get called away for international camps. Alanna Kennedy - Australian national team defender Alanna Kennedy comes to the Orlando Pride from the Carolina Courage (formerly the Western New York Flash) in a trade for Sam Wittenman. In addition to winning an NWSL championship with Western New York, Kennedy was on the Austrailian roster for the 2015 World Cup and the 2016 Rio Olympics, where she appeared with fellow Pride members Laura Alleway and Steph Catley. Chioma Ubogagu - Ubogagu comes to the Pride from the Houston Dash as another forward. In addition to playing in the NWSL, she has played in her native England with the Arsenal Ladies. She played with the Gunners in 2015, appearing in 21 matches and scoring seven goals. Ubogagu is another well-traveled member of the roster: though she was born in London, she holds American citizenship (her family is from Texas), and she has represented the USA at the U18, U20, and U23 levels in International play. But those were not the only departures from the club. In December it was announced that midfielder defender Mikey Ambrose had been taken by Atlanta United FC in the MLS Expansion draft, and Harrison Heath had been traded to Atlanta United FC for a 2019 draft pick. Then in January, Minnesota United FC bought the rights to original Lion Kevin Molino in one of the largest transfers in MLS history. That's not a complete surprise since former Orlando City head coach Adrian Heath is at the helm in Minnesota now, and the move re-unites Molino and his old coach. While losing Kevin Molino is something I was personally sad to see because of the production and experience he added in 2016, there are plenty of new faces for Orlando City fans to learn about and follow in the coming year. Danny Deakin - Deakin is an attacking midfielder whom the team selected in the third round in the 2017 MLS Super Draft. Deakin grew up in Sheffield, England, and played collegiately for two years with NCAA Division II team Mercyhurst. For his final two years in college he played with the University of South Carolina, and then played professionally in 2016 for the NPSL side Detroit City FC, where he appeared in nine matches, starting in seven, and had one goal and two assists. Victor "PC" Giro - Brazilian left back Giro signed with Orlando City from the NASL/USL side Tampa Bay Rowdies, who traded him for experienced Orlando City player Luke Boden. While I've appreciated Boden's accuracy on the ball, especially on set pieces, I've been a bit frustrated with the fact that most MLS strikers are too speedy for him to cover. Hopefully Giro will provide some additional speed on the defensive side of the ball, but we will have to see if he can match Boden's accuracy in distributing the ball to teammates. Will Johnson - Johnson is a ten-year MLS veteran who has won MLS Cups with Jason Kreis in Real Salt Lake and with the Portland Timbers in 2015. Most recently, Johnson played the 2016 season with Toronto FC. He signs with Orlando City as a forward/midfielder, and figures to bolster the club's attacking presence on the pitch. Scoring more goals will be vital to Orlando City, as they have finished just a point out of the playoff race in their first two MLS seasons, so improving goal differential and scoring more points will help get them "over the hump." Josh Saunders - Goalkeeper Josh Saunders signed with Orlando City SC from New York City FC, where he played in 2015 under head coach Jason Kreis. Saunders brings a fourth keeper to the MLS first team roster for Orlando City, alongside Joe Bendik, Earl Edwards, Jr. and Mason Stajduhar. Given Saunders' MLS experience, it's possible to see that he and Bendik will be the two keepers that make the day-to-day 18-man roster for the first team, while Edwards and Stajduhar primarily take duty with the USL side, OCB. Of course that's just mere speculation, and the team may have other plans in mind. Jonathan Spector - A defender with the USMNT, Spector signs with Orlando City after having played in the English Premier League and the English Football League Championship, where he registered 101 and 153 appearances respectively. Most recently Spector played with EFLC side Birmingham City, and he has also played for EPL sides Manchester United, Charlton Athletic, and West Ham United. Donny Toia - Donny Toia joins Orlando City after being taken first in the MLS Super Draft by Atlanta United FC. Toia is a fullback who played with the Montreal Impact in 2015 and 2016. Over the last two years, he made 48 appearances with the Impact (44 starts) and had one goal and two assists. At 25, Toia brings a combination of youth and MLS experience that should help Orlando City shore up its defensive line, which was a point of weakness in 2016 and led to Joe Bendik having to make one of the highest save totals in MLS due to the sheer number of shots that the team allowed on his goal. While this brings you up to speed on the new faces as we know them today, there is no certainty that the rosters of the constituent clubs will not change in the weeks leading up to the start of the season or after the season begins. Who are the new players that you are most excited to see joining the teams in Orlando City? And which players were you the saddest to see leave the club during these off-season transactions and roster cuts? Let me know in the comments below! Leadership Shuffle - Arguably the biggest news of the off-season involved Phil Rawlins stepping down from his active role as club President for personal reasons. No further details were made public, but the news came almost at the same time as he and Kay Rawlins announced they were separating. Phil has been named Club Life-President, while Alex Leitao will assume a more active role in day-to-day operations. Anxious fans may see shadows of the off-season turmoil that rocked the club after the 2015 season. I am hopeful that the change is not a political move but one that really is designed to let Phil focus more on personal and family matters after the enormous effort and stress he's put on himself to bring Orlando City to Florida, build the club into an MLS franchise, and spearhead the effort to build a new soccer-specific stadium. He certainly deserves some time to relax after all of that, and this fan hopes we will continue to see him about and around at matches, events, and other functions. Orlando City signs Victor "PC" Giro - The roster for Orlando City gained a little more youth when Victor Giro (known as PC) was signed from NASL side Tampa Bay Rowdies. Giro was with the Rowdies for the second half of the 2016 season. Prior to that, he played with the Ft. Lauderdale Strikers and he scored the winning goal for that side against Orlando City in their Round of 16 victory in the Lamar Hunt US Open Cup match last season. Four Orlando Pride Stars Earn USWNT Call Ups - The blessing and curse of having great players in a small league is that so many of them earn honors for their national team. Earlier this month, it was announced that Alex Morgan, Ashlyn Harris, Kristen Edmonds, and Ali Krieger would be called up for the USWNT camp in the middle of January. It was previously announced in December that Alex Morgan would start 2017 playing for French side Olympique Lyonnais, so she will be missing from the Pride lineup until the French season ends and that club concludes any playoff run. OCSC Re-signs Carrasco, Alston, and Hines - Servando Carrasco, Kevin Alston, and Seb Hines were re-signed to contracts with OCSC for the 2017 season. After Coach Jason Kreis arrived in the middle of the 2016 season, it was clear that Servando Carrasco was someone that bought into the new coach's scheme. He has always played with great energy and enthusiasm, and figured in some critical moments of the 2016 season, including getting the long-range assist on the goal that earned a draw in the dying seconds of the opening match of the year against Real Salt Lake. Hines is known for his prowess scoring goals with his head, and Alston is a speedy defender with the range to cover the entire length of the pitch when the need arises. Orlando Pride Add Offense in NWSL Draft - Serious sports fans often quote the old maxim "defense wins championships," but the truth is that "offense puts eyes on the game." In showing that the club leadership is serious about building the excitement and crowds for the NWSL Orlando Pride, they selected more offense in the draft earlier this month. In the third round, the Pride selected striker Danica Evans from the University of Colorado. Evans scored 11 goals in her senior season, and was invited to attend the U-23 USWNT camp earlier this month. In the fourth round, the Pride selected midfielder Nickolette Driesse from Penn State. Driesse won a championship in her sophomore season as a member of the same FSU roster that produced the Pride's Jamia Fields, and she won a National Championship in her junior season with Penn State, where she scored five goals and registered twelve assists. Orlando City SC Drafts Danny Deakin - In the MLS Super Draft, the MLS side selected Danny Deakin, who played for Detroit City FC of the National Professional Soccer League (NPSL) in 2016. Prior to going pro in this country, Deakin played his college soccer for the South Carolina Gamecocks. Deakin is an attacking midfielder, and continues the trend of signing more specialists at getting the ball into the opponent's net. At some point one begins to wonder if we will see a 2-3-5 formation with fully half the field players charged with the task of scoring goals every match. Orlando Pride Acquire Rights to Rachel Hill - In the 2017 draft, the Portland Thorns selected Rachel Hill, but in a deal struck subsequent to the draft, the Orlando Pride have acquired rights to the striker. Hill scored 61 goals and registered 18 assists as a collegiate player with the UConn Huskies, who play in the American Athletic Conference (AAC) along with local team UCF. Hill's collegiate record puts her second all time in career goals for the school, and fourth all time in total points (140) scored during her career. Orlando Pride Trade Witteman for Alanna Kennedy - Australian Women's National Team member Alanna Kennedy is headed to Orlando from the North Carolina Courage (formerly the Western New York Flash) in exchange for Sam Witteman. Witteman played her rookie NWSL season for the Pride and established herself as a great rookie talent. While it's sad to see her leave, it's exciting to see Kennedy join the club. At only the tender age of 21, Kennedy already has nearly 50 caps for her National Team, and has won regular season titles and championship cups as a professional since the age of 16, when she played for Sydney FC. Kennedy has played on teams that have reached the Grand Final of the Austrailian W-League four times, winning the cup in 2013 with Sydney. And in her first season in NWSL, the defender helped Western New York win a championship in 2016. OCSC Goalkeeper Coach Returns to Canada - Stewart Kerr, who came to Orlando City SC as goalkeeper coach at the same time Joe Bendik joined the team, has accepted a position with the Vancouver Whitecaps FC. Under Kerr's guidance, Bendik won the MLS Save of the Week 11 times in 2016 and finished with the second-highest save total in the league. I hope that the new keeper coach will continue helping Bendik perform at the same high level this season, as he certainly deserved the team MVP award he won at the season-ending banquet after the conclusion of last year's campaign. Tim Mulqueen Joins OCSC as First Team Goalkeeper Coach - Former MLS and Youth National Team goalkeeper coach Tim Mulqueen has joined Orlando City as first team Goalkeeper Coach. In addition to extensive experience working with some of the legends of US Goalkeeping, including Tony Meola, Mulqueen has also previously worked with Joe Bendik, Earl Edwards, Jr., and Mason Stajduhar, so he is familiar with many faces in the net for the club. USL Granted Division 2 Status - Soccer, like baseball, is divided into major and minor professional leagues in nearly every country where it is played, but the designation for these differences is called "divisions" by FIFA, the sport's governing body. In the US, MLS is the top "major league" or "Division 1" league. The NASL has been considered the Division 2 league in the past and USL has held the rank of the 3rd Division league. Now, starting in the 2017 season, USL will be considered a Division 2 league. USL Conference Alignment Announced - USL announced that the league will feature 30 teams in two conferences this season. Each team will play 32 games during the year. Most of those games will consist of a home-and-away match against each of the other 14 teams in their conference, with the remaining four matches being against regional rivals, and no team playing any single opponent more than 3 times in the regular season. The top eight teams from each conference will advance to the playoffs, and the USL Cup Final will be played in mid-November. These are some of the most significant updates and changes in the club over the last few weeks, at least from my perspective. What are some of the other stories that caught your eye? Let me know in the comments below! This is what most fans think: In the MLS, the theory goes that every game is played 11 on 11, at least until the red cards get drawn. But no matter whether your team is the home team or the road team, it almost always feels like the game is being played 11 on 15, with your team having to battle not only the opposing team, but the four officials as well. At least that's how I have usually felt. But toward the end of the the 2016 season, I got curious about what it's really like to be that "ref in the middle," and instead of simply whining about it as I am usually prone to do, I decided to make an effort to actually talk to an MLS referee and learn a little about watching the game from his perspective. To that end, I was able to secure a fairly extensive interview with MLS referee Ted Unkel. In doing my research, I learned one other interesting fact that also figured into my line of questioning--Ted is actually married to another professional soccer referee, Christina Unkel, who was also very generous with her time and answered my questions as well. The two referees answered my questions ranging from their path to becoming soccer officials, their thoughts on the state of the game in this country, and the differences they see between MLS and other top leagues in the world, and even how the game brought them together as a couple. Because Ted and Christina gave me so much material, there is enough for several posts. In this post I'll focus on their paths to becoming soccer referees and what it takes to do the job for anyone that has been curious about that career path. In subsequent posts, we'll cover their thoughts on the state of the game in the USA and finally some more personal reflections of how the game helped bring them together and some of their most and least favorite experiences as officials of the game. Lion's Teeth Blog (LTB): How long have you been involved in the game of soccer? Christina Unkel (Christina): I have been involved in soccer since I was born – 29 years. Having had a father play semi-professional in Guatemala, the sport has always been a part of my life as I know it. I played as soon as I was allowed to so probably when I was 5/6. I began to officiate when I was 10 years old. Ted Unkel (Ted): Like most, I played when I was young but nothing of note. I began refereeing when I was 12 as a way to spend more time with my father – he also gave me his game fee, which made it arguably the best part time job I could have. LTB: Did you come to the game first as a player or as a fan or as a referee? Ted: A player before I was able to make the choice to play – or drive myself to practice – and I hit my ceiling in high school. I’ve been a fan of the game as long as I can remember, originating in the EPL and expanding further with each new version of FIFA on whatever console my friends or I had at the time. LTB: Before becoming an official, was there some moment or some pivotal event that made you want to grab the whistle and put on the official's shirt? Christina: Yes. I was playing in a game, and unfortunately the young official in the center of my game was just “going through the motions.” He was incredibly uninterested in our game, was consistently getting calls wrong (more for the fact that he wasn’t trying), and was more concerned about impressing his friends off the field by goofing off. It frustrated/angered me. The official was being paid to do a job; he was not doing it, and it felt incredibly disrespectful. That was the game where I made up my mind that I could and would do a better job. I would respect each game/player and always give it my best. Also, my coach wouldn’t allow me to keep yelling at the officials until I took the referee course. So, of course, I wanted to keep yelling at the officials – I took the test and became certified! Ted: There wasn’t necessary a pivotal moment – in addition to being with my dad, I was pretty decent at refereeing. A bit of that was driven by seeing what referees I was getting as a player, and saying “I can do better than that”. There was a local youth game that started this whole thing back in 2004 – if I can point to anything, I can point to that game that started it all. Being free on a Saturday morning turned into an invite to State Final Four in Panama City, which I highly pondered not going because why would anyone travel that far just to referee a soccer match? Funny to think that now. LTB: What is the career progression like for referees in American soccer – is there a formal pathway from youth leagues to school / college and semi-pro leagues up to the professional leagues? Christina: Today, there is more structure and progression as to a pathway but overall still remains reliant upon being identified among the rest of the other officials at an event/tournament. With more eyes on our sport, more money being spent on the game domestically, and more at stake, the referee career progression has begun to catch up to the popularity and need for higher level officials to keep up with the game and its demands. That said, the systems are different in America then in other countries. For example, school/college is a different system run by state high school associations and/or NCAA; whereas, youth, semi-pro and professional leagues all fall under the umbrella of US Soccer and the Professional Referee Organization (“PRO”). With regard to personnel in the two systems, there is much overlap, such as NCAA assignors and US Soccer; however, the pathway for career progression to semi/professional leagues is through US Soccer and PRO. Identification is key. And to be identified, attending US Soccer events/tournaments and performing well is the first step to progression. PRO comes in at the tail end of that identification progression and identifies many of its potential candidates who demonstrate the skills/capabilities to advance their career through its own identification system/managers and conversations/cooperation with US Soccer. As to the basics, upon registration and successful completion of an introductory course and exam, one begins their referee career as a grade 9 or 8 and must take further education, satisfy game experience and age level requirements, as well as successfully perform on both written and physical games/standards to advance their grade from 9/8 to a national referee (grade 3) and potentially a FIFA Referee or AR (Grade 1 or 2 respectively). Ted: Everything starts on a local level – signing up to take a referee class, pass a written test and begin working youth games at a local club. US Soccer has a grading system, from Grade 9/8 (entry level) to Grade 1 (FIFA referee, which I am now). In between is a myriad of written and fitness tests, game requirements and assessments, tournaments and identification, academies and seminars. Similar to players, referees strive to develop and move up – From December 1-6, 2016, I mentored at U.S. Soccer’s Development Academy Winter Showcase in Sarasota. There’s an application process to get in, and travel costs are the responsibility of the referee – it shows a lot of commitment at an earlier part of a referee career to be part of such an elite event. Performance at events like this helps springboard a referee to assignments in more challenging tournaments and leagues. High school and college are separate from the path, though good games anywhere help to continue to develop a referee. I firmly believe there is no substitute for experience. LTB: What advice would you give a reader of the blog who has an interest in becoming a soccer official—where is the best place to find information or learn how to get started? Ted: Visit your local club and inquire either through the referees that are working those games or someone associated with the club. This ends part one of the interview. Look for additional posts in the Interview with Soccer Refs series to come in the days ahead. Happy Holidays, everyone! We've been on holiday break, but with the new year and the balance of the off-season right around the corner, there are a few things we will be doing between now and the time that the 2017 season for our three clubs kicks off. Offseason Roster Moves - Between the expansion draft and the MLS Super Draft as well as trades and other transactions, there will be new faces and missing faces from the 2017 rosters for the MLS, USL, and NWSL sides. We'll be talking more about those changes in the weeks ahead before the season cranks up. Stadium Tour - We're working on getting a tour of the new stadium and we will try to get some interviews with some of the people who actually worked on building our new "home away from home" for the 2017 season (especially for those of us with season tickets to multiple teams). Fantasy Soccer Report - For the last two years I've been playing fantasy MLS soccer to varying levels of success. Next season I'll be tracking my weekly lineup changes on the blog, and it will probably be a good lesson in what NOT to do to reach your fantasy finals. More Social Media Partnerships - In 2015 I started the Lion's Teeth Soccer Blog as a hobby. In 2016 that hobby allowed me to start getting some collaborations with some other voices in local soccer social media. I'm hoping to be able to expand that next year and get some more perspectives on the game we all love and the players that wear our favorite colors on the pitch. Happy New Year everyone. Have a safe and fun New Year's Eve, and we look forward to talking soccer with more of you in 2017! This year there will be an MLS expansion draft for Atlanta and Minnesota in mid-December. One of the provisions of this draft is that each extant MLS club can name eleven protected players that are not able to be selected by the two expansion teams. Toward the end of the season I discussed with a couple of other social media types about each of us putting together a list of who we thought Jason Kreis might put on his "protected" list. I have heard back from my friend Luis, and I have posted his list in another post. In this one I will publish my own speculation as to the names that the coach will put on his list. In the table below I post a photo of each player along with a few facts about the player's time with Orlando City and some reasons I could be right or wrong about each player. Why he's a keeper: He is the captain and even with the success of some younger players like Cyle Larin, Kaka is still the main star power attraction for the club. He is a leader on the pitch, on the training field, and in the clubhouse, who inspires his teammates and helps them be better players. He also seems to be a personal favorite of majority investor and owner Flavio da Silva, who is also from Brazil. Why I could be wrong: The move to Orlando was not personally easy for Kaka. It has been a factor in the dissolution of his marriage and it means that he is living in a different country from his children. He also missed several matches in both 2015 and 2016 with injuries, and at some point the enjoyment he gets from the game will cross a line with the pain it causes him and he'll decide it's no longer worth the latter to gain the former. Why he's a keeper:Larin has been the leading scorer for Orlando City in both of his two MLS seasons with the club. He can be a dynamic scorer and has the ability to score multiple times every game. And when he keeps moving without the ball, he can find ways to get open and in position to make one-touch strikes on goal that are hard for any keeper to stop. There's always talk about Larin having interest from Eurpopean clubs. If that is true, then it is more financially beneficial for Orlando City to wait until after the end of the current European season to sell his rights overseas: because of his status as a Generation Adidas player, the club will get a higher share of any money that is generated from selling Larin's rights to a team in another league. Why I could be wrong:Larin can be a streaky player, and that mainly has to do with his gameday attitude. If he comes out focused and intent on staying in the game on and off the ball, he can be amazing. However, if he starts getting lost in thought off the ball or stands around watching the game when the ball is not on his feet, he can look just awful. And it seems that when he gets in a funk it sometimes compounds by taking him more out of the game. Jason Kreis may not put up with that kind of intermittent focus, and may think the team is better off without a player that is extremely talented but not 100% focused every minute he is on the pitch. Why he's a keeper:Rivas played dramatically better in 2016 than 2015, but he did not get into as many games or play as many minutes as I would have liked. Between his first MLS and second MLS season with Orlando City, Rivas developed a much better habit of reading the pitch and deciding when it was better to shoot or to pass. He seemed so eager to shoot in 2015 that he often took wildly ill-advised strikes that went way too high or too wide to ever have a chance. In 2016 he took much better shots, and he proved himself to be a very accurate mid- to long-range passer, and could put the ball on the feet of an open teammate with a great chance to score. He also possesses blazing speed. Why I could be wrong:At this point I still think Rivas has more potential than he has shown. It depends on the mix of devlopment with long-term investment in young players and the immediate needs to win that Jason Kreis has in mind for building the team going forward. Rivas would be a tempting acquisition for an expansion team, as he looks like he is on the verge of having a breakout season. If Kreis believes he could get someone with a little more experience and a little more proven scoring ability, he might decide to leave Rivas unprotected. Why he's a keeper:He is one of the two best defenders on the team. Period. Yes he is young, and yes that means he makes youthful mistakes by being fooled into falling for the wrong feint by experienced attackers, but he has amazing closing speed and plays his heart out every match. Often he was assigned to mark the speediest and most dangerous striker on any opposing team, and Redding often prevented that player from getting any good shots on goals for the whole match. Defense is our weakest area, and so we need to have players with a lot of raw talent as well as great experience back there. Why I could be wrong:He is young. It's similar to the argument I made with Rivas. Depending on who is on the market that Jason Kreis believes he could bring to Orlando, it's possible that he might leave Redding unprotected, because he would be a great young player for an expansion team to add to their roster. Why he's a keeper:Along with Redding, he is the other best defender on the team, and he has a bit more experience to help mentor a younger player like Tommy. He's a speedy player and he is a good passer to boot, and can steal the ball and start counter-attacks that can lead to an Orlando City goal. Why I could be wrong:Ramos is a great defender, but he is young, and still has more skill to develop to go along with his natural athletic talent. If Jason Kreis wants a top defense in 2017, he might be willing to go after more seasoned players in trades or free agency and allow an expansion team to take a dynamic young player. I don't much buy that, but it could happen. Why he's a keeper:Nocerino was one of several players that Jason Kreis named during the second half of the season who really seemed to "buy in" and "be excited" about the new direction that the coach wants to take the club. He also played his best soccer of the year after Kreis arrived. This could be due to simply more time acclimating to the Orlando weather and his OCSC teammates, or it could be that some subtle change in the position or way Jason Kreis wants to use Nocerino allowed him to use his talent more effectively than he was able to display under Adrian Heath. He proved to be a very effective "safety valve" for the defense, and displayed great vision all season in terms of being able to see where the ball could be placed to help the team build up an attack. Why I could be wrong:Nocerino did not have the kind of immediate impact that fans and coaches were hoping we would see from him in 2016. I have a feeling that he was brought here more because Flavio wanted him than the coaches or soccer operations people wanted him here, and if the calculus of the front office thinking changed during the season with the hiring of Jason Kreis, then it's very possible that the same people who thought they wanted Nocerino here during last offseason may not be feeling the same way now. Why he's a keeper:Carrasco is one of the players who leaves everything on the pitch. In some ways I feel like he is a player in the mold of the NFL's Wes Welker. Carrasco is not the fastest defender on the roster and he doesn't always reach the ball to make the play, but he never leaves anything on the pitch. He gives full effort in going for every slide tackle, every block, and trying to close down every opportunity the other team has to attack. Also, along with Nocerino, Jason Kreis named Carrasco as one of the players who really was buying into his vision and helping other players buy into his vision for the team. Why I could be wrong:For all his efforts, one look at Servando's twitter feed is all you need to know. He fully embraces the fact that many people know him as Alex Morgan's husband, and I believe that now that the couple have had a chance to live and play in the same city, I don't think they will be eager to play in other places again. There have been a lot of rumors this offseason connecting Alex Morgan to French side Lyon, and if they offer her enough money (and offer Servando an opportunity to play on the men's team), then they could both be gone from our city. Why he's a keeper:He ended the regular season with the most saves in MLS. He also made some amazing plays during the season, including winning the MLS Save of the Year. His peers on the club also voted him team MVP at the annual awards gala last month, so it's clear he is beloved in the locker room as well as in the stands. Why I could be wrong:I really don't think I am, but there could be something that Jason Kreis has seen in practice that makes him think we might be better off keeping Earl Edwards, Jr. (who has always performed well when we have had a chance to see him) and let Bendik go. In any case, I think both keepers are capable of being MLS starters, so I think one will be left unprotected in case one of the expansion teams would like to build around a solid goalkeeper. Why he's a keeper:MPG, as he is known, was by far the most effective acquisition the team made during the season. I was sad to see Darwin Ceren leave the club, but he did not have a great season, and apparently he did not fit into the plans that Jason Kreis has for the club going forward. MPG's speed and skill have been great for the club. He's also a fantastic passer and has great instincts to dispossess opponents of the ball as well. Why I could be wrong:I really don't think I'm wrong on MPG either, but it's possible that as an international player he could have some sort of pressure from family back home, like the situation that caused Adrian Winter to leave the club early in the season and return to Switzerland. Beyond that, I think that as someone who contributed a lot to the team after Kreis came in, I don't think he's likely to be left unprotected. Why he's a keeper:Higuita could be considered the emotional spark plug of the team. He is also a very good holding midfielder, with a passer's skill and a defender's talent. I think he may be the player who displays the most raw passion of anyone on the roster. He was very frustrating to watch last season and early this season because he seemed to pick up at least one yellow card every other match he played on the pitch. But I noticed that he seemed to quickly figure out where the line was and stay on the legal side of it after the first time he was suspended in the Jason Kreis era. I have a feeling that it wasn't any kind of threat or negative reinforcement that the new coaches gave him, but they may have helped him figure out how to more positively channel the impulse and energy that makes him want to react poorly. Why I could be wrong:Like so many others on the roster, Higuita is young. He's talented, but he still probably has more potential than production at this point and it's possible the club will want to open a roster spot to bring in a player with more experience. Why he's a keeper:Shea is a fan favorite and he shows flashes of brilliance. He is capable of making lovely long-range shots and has the speed of a gazelle that lets him play the entire length of the pitch. Shea can also make great passes from deep into the attacking area, and he is not a selfish player--he will shoot when he is the best option, but he seems to want to find a teammate with a better shot on goal before trying for glory for himself. Why I could be wrong:Shea did not have a chance to play much after Kreis arrived due to injury, and he has missed portions of both of the last two seasons with injury issues. The coach may decide he's a bit too injury-prone to warrant his relatively high salary and may choose to allow him to be unprotected for one of the expansion sides. What about you? Who do you think Jason Kreis will protect in the expansion draft? And do you think my reasons for keeping or potentially losing any of these players is incorrect? Let me know in the comments below!